Successful learning depends, Aesthetic Realism explains, on a student’s liking the world by seeing it truly through the subjects he studies. Yet, by the time students get to school, they have often seen many things which make it difficult to feel the world can be liked—worry and anger at home, people sleeping in doorways or cardboard boxes, people hurting one another. It is a wonder some students get there at all. There are things that are unjust, and that we have to be against. Aesthetic Realism is new in explaining that there are two ways of being against things, and our lives depend on our being able to distinguish between them. We can be accurately critical of the injustice we meet, with a hope that it change, and, as much as we can, do something to change it; this is in behalf of liking the world. Or, we can use what we see to disparage the world, see it as worthless and ourselves as superior. “There is a disposition in every person,” stated Eli Siegel, “to think we will be for ourselves by making less of the outside world.” This is contempt, and it is the most hurtful thing in man; it is the cause of people’s exploiting each other for profit; of racial prejudice; of children’s making fun of each other. The one way to like the world—a world that has wars, economic injustice, and parents that confuse us—is through seeing that the world has an aesthetic structure: it is a oneness of opposites, like difference and sameness, freedom and order, motion and rest, manyness and oneness. Further, these opposites are in us all the time, and we are trying to make sense of them, see them as one. I’ll tell about what my students and I learned about an aspect of literature that shows clearly how the desire to like the world opposes contempt—satire. We saw that the difference between contempt as people usually have it and satire is the difference between being against the world and being for it, between sneering at the world, and honestly liking it. When I first met them, the students in the 10th grade classes I was teaching showed a desire to know the world that affected me very much. Yet many of these same students were driven to mockery, as so many people are. Insults, often consisting of four-letter words, flew across the room as they entered; in the moments before the late bell, small groups of students sat laughing together in the back of the room, often about other students. The feeling that everyone is insincere and worthy of scorn, particularly people who are apparently different in some way—such as age or ethnic background—is perhaps more intense during high school than at any other time; it makes a person cruel. People who have committed and been convicted of hate crimes, which my students followed in the news, show, in a ferocious way, that scorn for difference, that coldness to other people’s lives and feelings that goes on all the time. It once did in me. In an Aesthetic Realism consultation I had when I was only a few years older than these students, I was asked, “Do you think that a half-hour goes by in which you don’t mock people? Have you felt that you were most sure of yourself when you could mock?” I had; —I’d based my personality on quietly sneering at the world and people, including my parents, teachers, and men. But I loathed myself; I walked around with a heavy feeling, and a pervasive sense that my life wouldn’t come to much. I was also terrifically lonely. I needed to know what I later learned from Aesthetic Realism: that we mock at our own peril. While we think we’re building ourselves up by mocking people, we’re really destroying our relation to the world. When I began to study Aesthetic Realism and my contempt was criticized, I felt for the first time that I could be proud of my relations to people. I am more grateful than I can say that now, instead of being driven to scorn people without limit as I once did, I feel I am more myself in wanting to strengthen people, to be a means of their knowing and liking the world and themselves. This is why I became a teacher. A literary manner which blends a critical attitude with humor and wit to the end that human institutions may be improved. The purpose of true satire is to take an ugly thing and present it gracefully and humorously, so that the ugliness is seen. When satire shows the cheap and the ugly, it is on the side of beauty because, essentially, it is based on the desire to make reality more beautiful. This, we saw, is different from the purpose most of us have when we see things in people we are critical of. Students mentioned some of these things. “Their attitude,” said Leroy Goodwin. Jamal Jackson said he didn’t like it when people were hypocritical, criticizing others for things they did themselves—”especially grownups,” added David Randall. “How do you show you’re against this?” I asked. David said, “Sometimes I get mad, and think—’Well, look at you. '” “So, you make fun of people?” I asked. “Yes,” he said. While this seems so ordinary, so everyday, it has disastrous effects, on oneself—hurting one’s mind and ability to learn—and on others. The boredom and depression rampant in our schools come from this contempt. I learned from Aesthetic Realism that when a person sneers at one thing after another, making them meaningless—either outwardly or in his mind—it comes to take in the whole world. Opposites central in both contempt and satire are for and against. I asked, “When you have contempt for a person, are you against the person, against the world, and inaccurately for yourself?” “Yes,” David answered. True satire is a oneness of opposites. The satirist ridicules things in people too, but he isn’t against the world; he is against the thing in man that is hurtful, and for the best thing. A satirist’s purpose is to have the world be in such a way that it can be liked: he makes humor out of his criticism so that people will see it, and change. 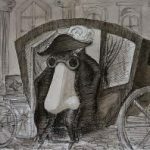 We began to read a story by the Russian author Nikolai Gogol (1809-1852): “The Nose.” I loved this story when I was in high school and when I looked at it again, with the knowledge of Aesthetic Realism, I knew more about why. In this classic story, which translator David Magarshack describes as “a biting exposure of the snobbery, complacency, and stupidity of the…upper classes” in Czarist Russia, Gogol uses the nose to represent two aspects of contempt which I had steeply—snobbishness and superiority. Kovalyov stretched and asked for the little looking glass standing on the table. He wanted to look at the pimple which had appeared on his nose the previous evening, but to his great astonishment, instead of his nose, he saw a completely empty, flat place! Frightened, Kovalyov asked for some water and rubbed his eyes with a towel: there was no nose! I asked, “What do you think Gogol is criticizing?” Kovalyov was too impressed with himself, they saw, and he had contempt. You can’t look down your nose at people if you don’t have one. Kovalyov is presented as ridiculous, running all over the city—to the police commissioner, to the newspaper office to place an ad—trying to find his nose, which stands for his supposed superiority. But as we laugh at him, it is in behalf of liking the world, because Gogol wants us to recognize this tendency in ourselves, and through seeing it as laughable, to change. Suddenly [Kovalyov] stopped dead in his tracks;…a most inexplicable thing happened before his very eyes: a carriage drew up before the entrance, the carriage door opened, and a gentleman in uniform jumped out….Imagine the horror and, at the same time, amazement of Kovalyov when he recognized that this was his own nose!…He wore a gold-embroidered uniform with a large stand-up collar, chamois-leather breeches, and a sword at his side. From his plumed hat it could be inferred that he was a State Councillor, a civil servant of the fifth rank. Students laughed when they read this. It is funny. It is also critical. We spoke about the fact that the nose, which had been on Kovalyov’s face only the day before, is not only walking around, but has a higher government position than himself. 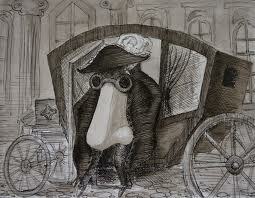 He had used his nose to be superior to other people, and now his nose is superior to him. “I guess he’s showing the snobbishness in everybody,” said Ana Colon. The nose looked at the major and frowned slightly. We saw that in this incredible dialogue Gogol is satirizing the feeling that a person different from us is automatically inferior. He shows how cruel this way of seeing people is, having Kovalyov say a woman selling oranges isn’t important enough to need a nose; Gogol also shows it is ridiculous, having the nose disavow any relation to Kovalyov because he is serving in a different department. But, I said, differently from how most people respond when they see snobbishness in someone—by having contempt themselves—he is educating people. Gogol is saying, ‘Look at this ugly purpose. I’ll make it look so absurd, so ridiculous that when people see it, they will want to change.’ It is a tremendous thing that man’s mind got to the point that he could express criticism in such a way that the world was more liked, not more despised by people. Kovalyov returns home, dejected. Suddenly, a police officer knocks on the door, asking, “Did you lose your nose, sir?” The nose has been found, and Kovalyov is overjoyed to have it once again. There is still one problem, though: he can’t get the nose to stick. “Why not?,” I asked the class, “Do you think he has learned enough from this experience?” “No!,” they said. “He’s still a snob.” This, unfortunately, is true, even when Kovalyov wakes up one morning to find the nose right where it belongs, on his face. The students saw he was not grateful enough, continuing to feel important by being a snob. This is all very improbable, Gogol tells us, but says, “all the same, on second thoughts, there really is something in it.” That “something,” Aesthetic Realism explains, is the criticism that art represents—in this case, the art of satire. My students and I were seeing that satire is against man’s desire for contempt, and is a means of liking the world, because it puts opposites together: it is for and against beautifully, and for the same purpose; it makes less of something ugly in order to make goodness greater. Those who run our schools should ask these students why they say what they do. Every student in a New York City school should be able to learn what Tricia Warren learned—how to be a beautiful and kind critic of the world and oneself as a means of respecting both—from the day he or she enters kindergarten, and it is unbearable to me that they do not. When the Aesthetic Realism of Eli Siegel as Teaching Method is the basis of education in New York and elsewhere, there will be deep, true success in our schools at last.